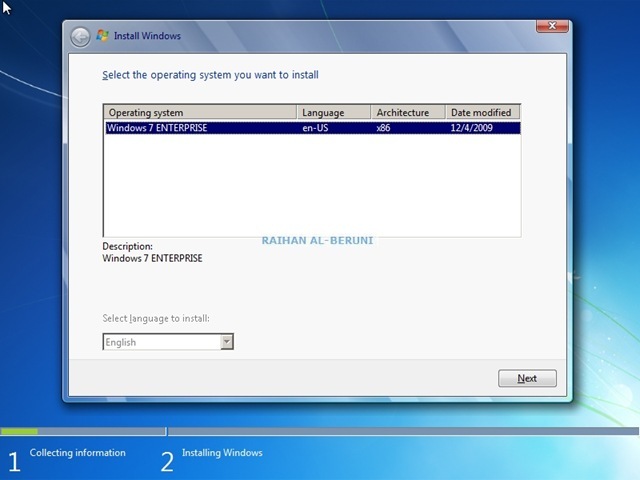 In old remote installation services, you have the options to customize computer name or select automatic installation while running RIS on a client. 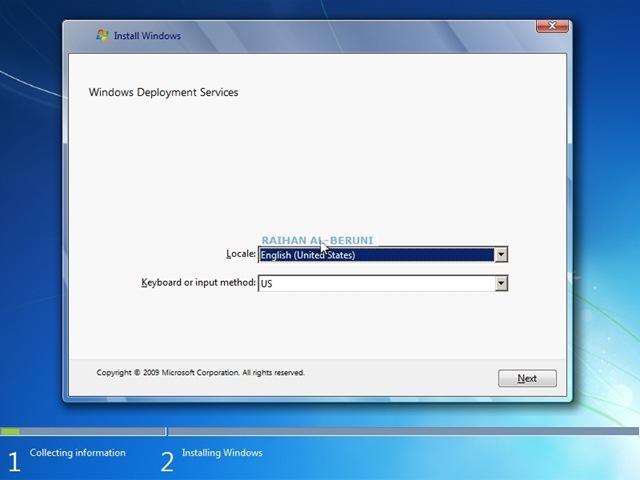 similarly, new Windows deployment services has the option for you to set naming policy in Windows Deployment Services server. 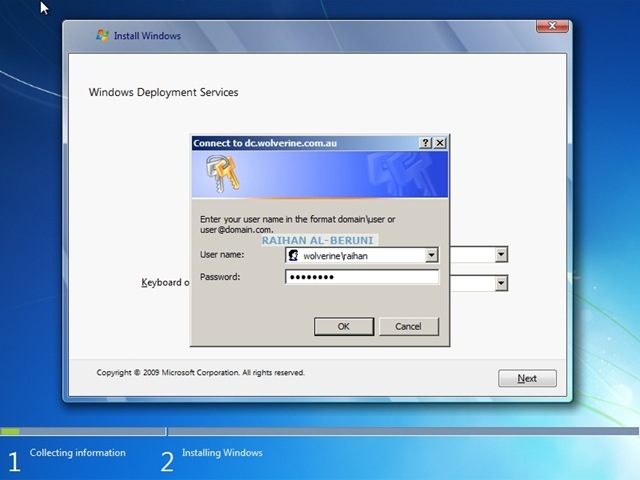 In WDS server, by default naming policy set to %Username%# that means WDS will create computer name using username who logged on when running remote installation process and # is the number 1,2,3..up to 999 will be added after username. To Set naming policy and default organisational unit in Active Directory. Log on to WDS server using domain admin credentials. Set Automated name add the string you want and browse and point the OU in Active Directory you want to place computers. To set custom name and approval process for WDS client. Click PXE Response settings Tab. Check For unknown clients, notify administrator and respond after approval then apply and ok. Warning! Apply this may result all unknown computers and manually added computers (computer didn’t use WDS for windows installation) in Active Directory will auto boot up to WDS services without pressing F12. Now boot an unknown client i.e. new client in the network. Client will automatically boot using WDS. Log on to WDS server and go to pending devices as shown here. Select and right click the computer that’s waiting for approval, click name and approve. Type Name and Approve this pending device. 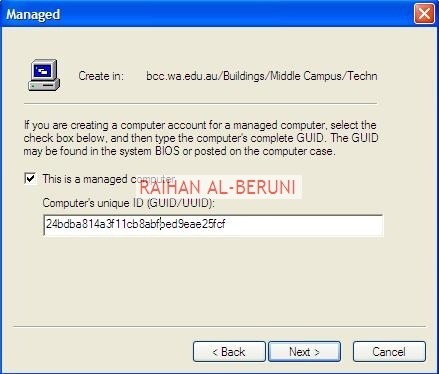 If you want to place this computer in a specific OU in Active Directory then click location and place in that OU. In the console tree, right-click the organizational unit that will contain the new client computer. Click New, and then click Computer. Type the client computer name, click Next, and then click This is a managed computer. In the text entry field, type the client computer’s globally unique identifier (GUID/UUID) and then click Next. Now this re-image this computer by pressing F12 while booting. 1. Log on to Windows XP Machine. Open Command Prompt>Change directory to C:\Windows\system32\wbem Type wbemtest.exe hit enter. 2. Click Connect. Change root\default to root\cimv2 >hit connect. 3. Click Enum Classes button>choose Recursive>Click ok.
5. In the Properties box scroll down, choose UUID and click Instances button. In the Query Result, Select Win32_ComputerSystemsProduct double click on it and another Object Editor will appear and it contains desired UUID for the computer. It’s painful process but you may find UUID in some computer and laptop’s bios. For example, on IBM R61 laptop I got UUID in bois. I was stuck for hours and scratching my head to find out a solution of this problem. I googled heaps but outcome is zero. Here, I will show you how to resolve this issue. Why it happens? This is an weird problem I have ever seen. What it says in error practically not that case. You will not find any event log for this error in event viewer. It happens for WDS mixed-mode server. It shows that error for several reasons. As I said this is a weird error though I have enough space in both partition still I got that error. However, I did followings to resolve my problem. Must have more then enough space in C:\ drive and Remoteinstall partition. Remember Microsoft Windows needs extra disk space for Pagefile, shared memory for RAM, temp folder and on top of that disk space for WDS WIM file in TEMP folder of system partition. Also you need enough disk space for Drive:\remoteinstall\temp folder. Check Temp folder configuration. System Property>Environment variables. 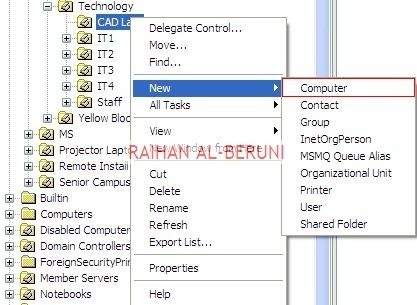 You must point TEMP folder to %Windir%\Documents and Settings\%USERPROFILE%\Local Settings\TEMP. You must see these four .bcd files in remoteinstall\temp folder after you add boot.wim and winpe.wim image otherwise WDS will not work properly. DO NOT DELETE THESE FILES. Type WDSUTIL /set-server /DefaultX86X64ImageType:both on command prompt to set WDS boot and read x64 and x86 format image. Add separate image group for the image you are loading. Now reboot server and you are laughing. Must have more then enough space in C: drive and Remoteinstall partition. Remember Microsoft Windows needs extra disk space for Pagefile, shared memory for RAM, temp folder and on top of that disk space for WDS WIM file in TEMP folder of system partition. Also you need enough disk space for Drive:remoteinstalltemp folder. Check Temp folder configuration. System Property>Environment variables. 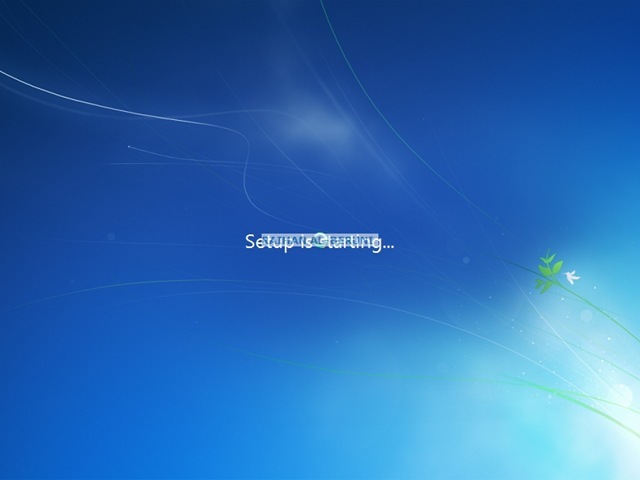 You must point TEMP folder to %Windir%Documents and Settings%USERPROFILE%Local SettingsTEMP. You must see these four .bcd files in remoteinstalltemp folder after you add boot.wim and winpe.wim image otherwise WDS will not work properly. DO NOT DELETE THESE FILES. I would like to explain a bit about IP Multicast before I start with WDS multicast image distribution because not all the organisation have existing multicast infrastructure. Still, I reckon it would be worthy to know bits and pieces of a technology while working on it. So what is IP Multicast? 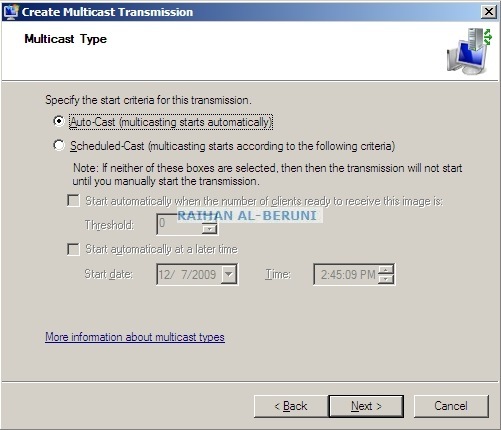 Multicast is a technique for one-to-many communication over an IP infrastructure in a network. It scales to a larger receiver population by not requiring prior knowledge of whom or how many receivers there are. Multicast uses network infrastructure efficiently by requiring the source to send a packet only once, even if it needs to be delivered to a large number of receivers resulting bandwidth savings. The nodes in the network take care of replicating the packet to reach multiple receivers only when necessary. The most common low-level protocol to use multicast addressing is User Datagram Protocol (UDP). IP addresses from 224.0.0.0 to 239.255.255.255 are designated as multicast addresses. This range was formerly called “Class D.” The sender sends a single datagram to the multicast address and the intermediary routers take care of making copies and sending them to all receivers that have registered their interest in data from that sender. Multicast IP ranges assigned through DHCP scope. In any case, range 224.0.0.0 through 224.0.0.255 is reserved for local purposes (as administrative and maintenance tasks) and datagram’s destined to them are never forwarded by multicast routers. Similarly, the range 239.0.0.0 to 239.255.255.255 has been reserved for administrative scoping. 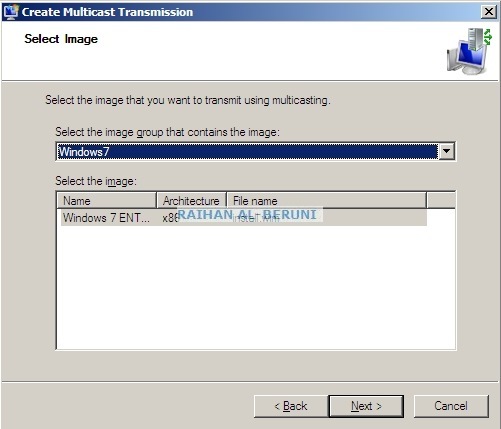 WDS Multicast Image Creating multicast images in WDS server is easy and straightforward if you have a functioning multicast infrastructure. 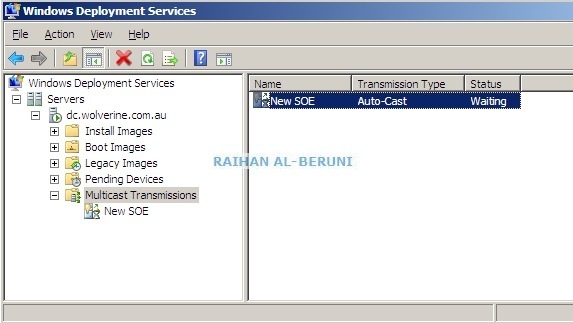 For multicast imaging to work properly, the network devices that connect the WDS multicast clients to the WDS server providing the multicast transmission must support and allow multicast traffic as mentioned above. If the WDS server already contains tested boot and install images. 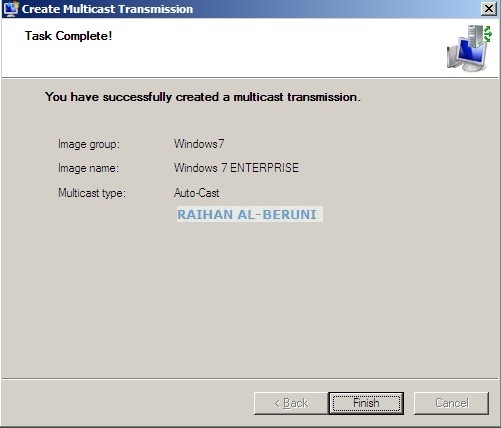 One important point to note about multicasting is that only the Windows Server 2008 boot.WIM boot image file contains a WDS multicast client. 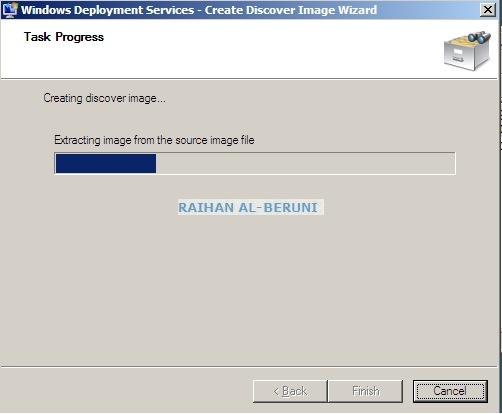 In WDS server, you have to add Windows Server 2008 boot.WIM file into boot image. Now follow the screenshots bellow to distributive multicast image. Delete Multicast image when distribution no longer required. Log on to WDS server using Admin Privilege. Go to Administrative Tools>WDS>Servers>Expand WDS Server>Right click on Multicast Transmission>Click Create Multicast Transmission. Here, you can schedule transmission if bandwidth and distribution time are criteria. 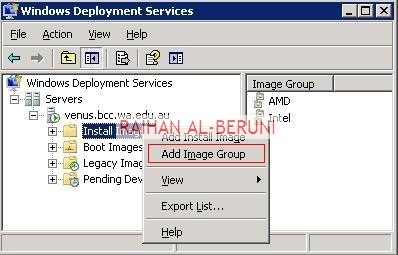 A bootable ISO is created from an existing WDS boot image and capture image that contains Windows PE and the WDS client can be stored on DVD or CD making it easier to deploy images to older systems or on heterogeneous networks that have PXE issues. 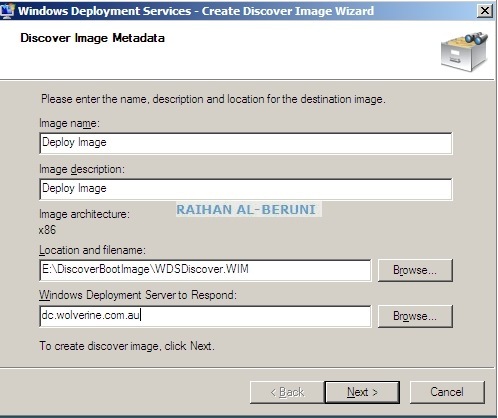 To accomplish discover image process, you must have a working WDS in network and Windows 7 AIK installed in WDS server. Log on to WDS server using domain admin credential and follow the screen shots. Now you have created ISO boot image. Burn this ISO on a CD or DVD and boot client machine using this cd and deploy images.